Do you remember the report by IMF advisors Blanchard & Leigh “Growth forecast errors and fiscal multipliers, who were admitting the negative effects of the austerity measures? French weekly magazine Marianne wrote an article about the fatal mistakes made by the International Monetary Fund and located the calculation error – the wrong multiplier! The admission is incredible, almost unimaginable. Four years after the onset of the Great Depression that shook western economies with unparalleled violence since 1929, one of the greatest economists of the world, namely the Director of the Research Department of the International Monetary Fund recently published a report in which he admits that the IMF – and with it, all the European leaders, finance ministers, central bank, European Commission … – have seriously underestimated the negative effects of austerity policies imposed on countries most debt. Yes, you read that right: Olivier Blanchard, one of the most renowned economic luminaries in the world, admits black and white, in a 43-page report published on 3 January, the IMF was wrong about the whole line. And the fault comes from a simple calculation error, a factor well known in the discipline: the multiplier. 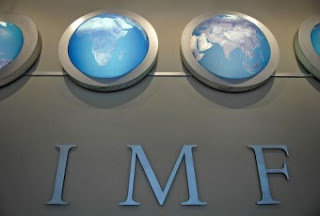 Between 1970 and 2007, the IMF forecasters had found that 1% of public spending less – or more tax – resulted in an average 0.5% growth in less developed countries. 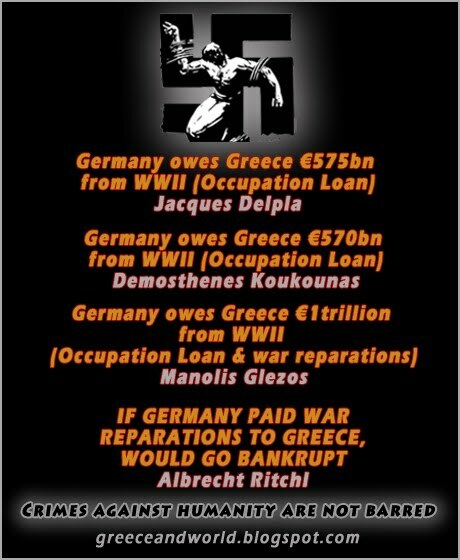 Is a multiplier of 0.5, they learnedly retained in the preparatory plans of aid to Greece or Portugal. But that was before the crisis and its share of uncertainties that disrupt the behavior of consumers. Inaugurating our new translation effort, we deliver you interesting texts from Greek literature, making them accessible across the world. This is an excerpt from the introduction at ISIS and OSIRIS of Plutarch by George Raptis. An astonishing theory! Egypt in prehistoric and historic ages. 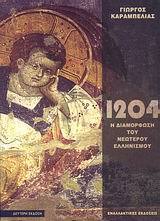 In this context, therefore, of the critical and controversial attitude towards History, the definitive conclusions we have for Egypt is that it is a country in the Mediterranean basin which, before the cataclysm was inhabited (or conquered) by Greeks (Hellenes) and later by Minoan Crete Greeks, after it experienced a brilliant way with the Pharaohs and the expansion of its power in Africa and Asia, it was conquered by the Arabs, during the Alexandrian era it was conquered by Alexander the Great and was ruled by the Ptolemaic kings. The roman era followed and, the rest of the history is accurately known. 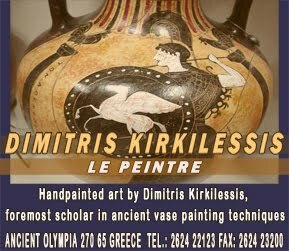 We shall confine ourselves to this general introduction to the project "ISIS and OSIRIS ¨" handsomely to throw our opinions (because the complete and thorough analysis is a matter of a separate history book). 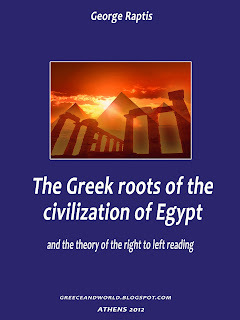 The Greek (Hellenic) roots of the civilization of Egypt and the theory of the right to left reading. 1. The name of the ancient country of Egypt is Greek and has its paternity in Greek mythology. Egypt (Aegyptus) was son Velos and Anghinoe, a descendant of Poseidon and Livia, twin brother of Danaos.Etymologically, the word is probably complex composed by the words Αιγιής + ύπτιος which means something like stretched Aegean as an extension of the sea on the African continent remnants of its bottom is the enormous desert with sand and shells (as referred by Plutarch). 2. Many of the names of the first Pharaohs have etymological affinity or resemble to Greek names, especially Minis or Menes or Men who took the initiative (according to the Egyptian tradition recorded by historian Manetho) to unify Upper and Lower Egypt, into a people that possessed productivity and resourcefulness in the valley of the Nile, but lacked political instinct. The consolidation is referred to have taken place around 3200 to 3000 BC and is associated with the military conquest and political maneuvering of Menes, who built the city of Memphis on the strategic spot where the Nile splits and forms the Delta. The word Menes leads to Minos of Crete, the Minotaur and the labyrinth that architectural and construction exist in Egypt. 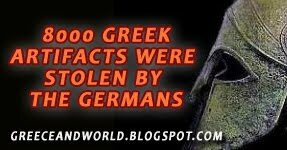 Etymologically also the word Pharaoh can be linked with the Greek word Φάρος =Pharos (name of the island initially at the shearwater of the gulf of Alexandria – which is mentioned by Plutarch and Homer- and which at the Alexandrian era was joined to the mainland due to silting.) Word that is comes from φάος/phaos= light to designate the “enlightened” ruler. 3. A number of cities (Thebes, Heliopolis, Apollonopolis, Hermopolis, Heracleopolis etc.) 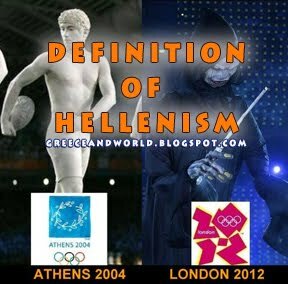 undoubtedly have names of the Greek Gods. The word Israel (determinative of the chosen people of God), which means the one that looks to God, has an etymological affinity with the Greek language. The first synthetic Is- means vision, knowledge and the other two (ra-, el) are referring to the names of RA and Helios (Sun), since God is the Helios (Sun of justice). So Israel is "the people who know God Ra, the Sun," deified in all known religions of the East in antiquity. The word Israel might have also been “suffered” the adventures of Istanbul, ie to be a corruption of the phrase "rushes the Sun Ra=Israel” (εισορών τον Ρα-Ήλιον) just like “εις την Πόλιν” (is tin polin=gr. to the city) became Istanbul. If these mythological, etymological and geographical approaches are not scientifically documented and convincing, simply by touching the field of coincidence or a homophone, reading the names of many other Pharaohs, gods, rivers, cities, etc. Reading from left to right the Greek presence and naming is revealed, thus excluding the case of coincidence, because it is repeated with great frequency. 1. Osiris left to right syllabic is read Sirios (Οσιρις=Σίριος=Σείριος=Sirius). Isis respectively is the same. The cities Radar and Karnak also. Osiris has all the characteristics of the star Sirius! 2. The Ammoun Ra (the Ammoun Zeus,) is read from left Noummas. In Egypt, worshiped as a god in ancient Greece Noummas is a mythical person or great sage who civilized Rome. Noummas is known in the mythology of creation of Rome by Romulus and Remus. After the fratricide, Noummas is referred as the second king (Pompelius) who taught in Rome on the unnegotiable value of human life, coming to the city from the East. 3. The Pharaoh Djoser, manufacturer of the first scalar pyramid from left to right is read Resos (Zoser=Ζοσέρ=Ρεσοζ=Ρήσος=Rhesus). Rhesus for the Greek data is the son of Oceanus and Tethys, king of the Thracians, and he is mentioned in Homer's epics. (Pyramids perhaps originally functioned as bastions with their levels and later evolved to funerary monuments. Etymologically, the word can be produced from πυρ(pyr)+ αμάω-ω (amao) fire + lit undoubtedly have a relationship with light and perhaps with solar energy. 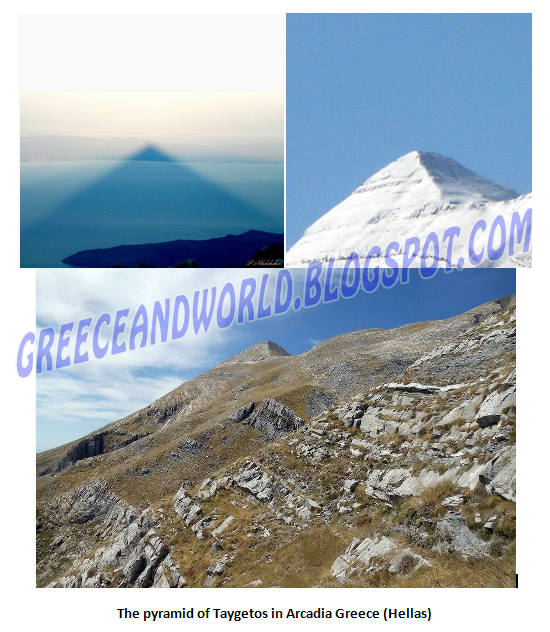 Ancient pyramids exist in prehistoric Greece, famous is the pyramid of Taygetos (see picture below) in Arcadia and in other parts of the world to America. 4. The river Nile from right to left is read Elin = El(l)in = Έλλην = Hellene. Maybe it is the river that the Greeks (Hellenes) first sailed from its estuaries to its sources. The Greeks – Cretans pioneers in their exploratory voyages, creating trunk mounds in its nearly flat stream making the reverse floating possible, as it is currently the in the Panama Canal. Or perhaps the river Nile was described as a large tube, as it crosses a vast expanse of 7000 kilometers. 5. 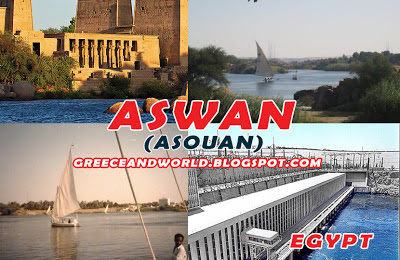 Aswan, the point with the highest waterfall of the river Nile, is read Nawsa (gr. Ασουάν = Νάουσα) . Etymologically in Greek, the word indicates a place with lots of water produced from the verb ναω- ϖ =flow. Both Naoussa in Northern Greece and Aswan are places known for their waterfalls. In Mesopotamia also the city A(s)wan lies on the banks of the River Tigris. 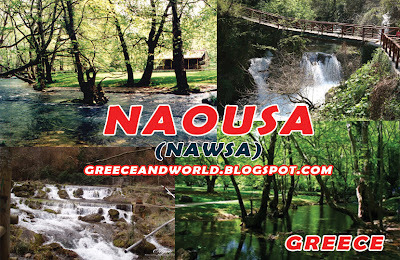 Namely in places with existence of many waters, we have cities named Naoussa (Nawsa) in Greece and Aswan in Egypt and Mesopotamia (Nawsa=Aswan). Does etymologically to the Egyptian language, the word Aswan mean anything? 6. The Suez Canal, by the same logic, is read Zeus (Zeus=Suez). 7. Port Said is the Port Dias=Δίας=Ζευς=Zeus. Perhaps the Almighty King "of gods and mortals", at an unspecified time in centuries, or his immigrant believers, immor-talized the passage or the conquest of the region by naming the area (and wor-shiping him as Ammon Zeus) to Egypt. Then again, it was to the left to right reading of the Arabs in both naval and commercial centers (Zeus and Dias) that existed at both ends of the Suez canal. 8. The city Serbal (Serbal-lambres=Λαμπρές) is related to a unique monument- a glow that illuminates only during the equinoxes the sign of the base of a hidden statue of the god, with metaphysical message. 9. The city Serib (Serib=Bires=Μπύρες (beer)) until now is the largest brewing center. Aristotle records that "Greeks get drunk with wine and the Egyptians with beer " Plutarch relates the discovery of beer to Dionysus (who is identified with Osiris in Egypt) from the plenty of barley that is produced naturally in the alluvial soil of the Nile valley. 10. The city of Thebes – Θῆβαι - (plural) is the region with the many burials. From right to left reading is Άιβηθ -> Άιδης -> Hades hence the cemetery or the place of the dead. Maybe corrupted in pronunciation is the oasis Siwa or Siva, where the archaeologist Soulvatzi is looking for the tomb of Alexander the Great. Moreover Thebe in ancient Greek means pothole. resembles to the singular of the city of Thebes that in Greek is Thiva.